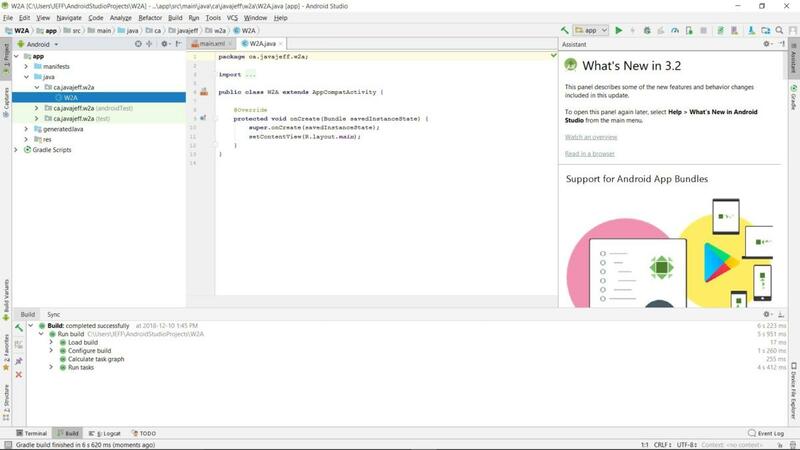 In Part 1 of this beginner's introduction to Android Studio, you set up Android Studio in your development environment and got to know the user interface. Now, in Part 2, you'll code your first app. The animated mobile app consists of a single activity, which presents Google's Android robot character and a button for animating the character. Clicking the button causes the character to gradually change color from green to red to blue, then back to green. While the app isn't especially useful, writing it will help you get comfortable with using Android Studio. In Part 3, you'll build and run the app using an Android device emulator and a Kindle Fire tablet. Note that this series has been updated for Android Studio 3.2.1, the current stable release as of this writing. I introduced Android Studio's main window at the end of Part 1. 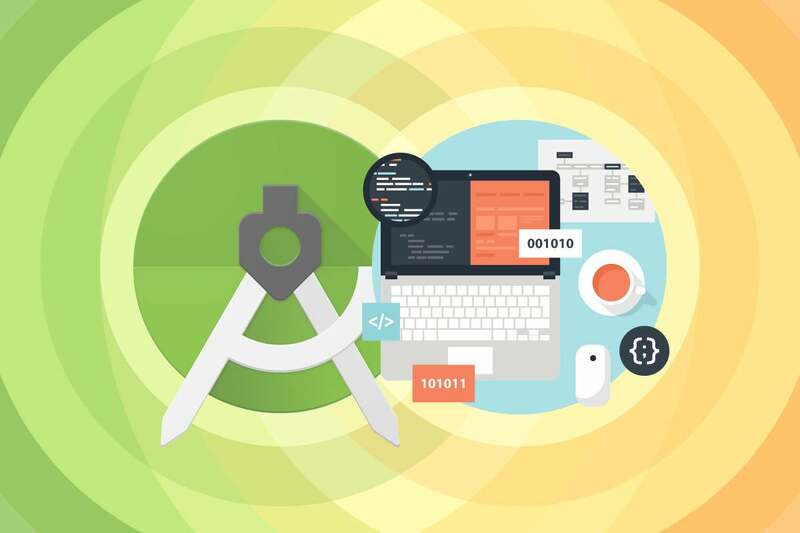 This window is divided into several areas, including a Project window where you identify an app's resource files, and various editor windows where you'll write the code and specify resources for mobile apps in Android Studio. The Project window and an editor window are shown in Figure 1. The Project window highlights W2A, which is the name of the app's W2A.java source file (although the .java file extension isn't shown). Corresponding to W2A is an editor window, reached by double-clicking W2A in the Project window. The editor window reveals the file's current contents, in this case the skeletal Java source code for the app's main activity. Each editor window is associated with a tab. For example, W2A's editor window is associated with a W2A.java tab. A second tab identified as main.xml (the default XML-based layout for the app's main activity) is also shown. You move from one editor window to another by clicking the window's tab. Download the source code for the Android example app: W2A.java. Created by Jeff Friesen for JavaWorld. The example app (W2A.java) consists of a main activity that displays the Android robot character and a button. When the user presses the button, the robot animates through a series of colors. In this section, we'll explore the activity's source code and resources. The activity's source code is stored in the file W2A.java, presented in Listing 1. The W2A.java file starts with a package statement, which names the package (ca.javajeff.w2a) that stores the W2A class. This is followed by a series of import statements for various Android API types. Next, the code describes the W2A class, which extends android.app.Activity. W2A first declares an androidAnimation instance field of type android.graphics.drawable.AnimationDrawable. Objects of type AnimationDrawable describe frame-by-frame animations, in which the current drawable is replaced with the next drawable in the animation sequence. A drawable is something that can be drawn, such as an image. AnimationDrawable indirectly extends the abstract android.graphics.drawable.Drawable class, which is a general abstraction for a drawable. All of the app's work takes place in W2A's overriding onCreate(Bundle) method: no other methods are required, which helps to keep this app simple. onCreate(Bundle) first invokes its same-named superclass method, a rule that must be followed by all overriding activity methods. R is the name of a class that's generated when the app is being built. This class is named R because its content identifies various kinds of application resources, including layouts, images, strings, and colors. layout is the name of a class that's nested within R. An application resource whose ID is stored in this class describes a specific layout resource. Each kind of application resource is associated with a nested class that's named in a similar fashion. For example, string identifies string resources. main is the name of an int-based constant declared within layout. This resource ID identifies the main layout resource. Specifically, main refers to a main.xml file that stores the main activity's layout information. main is W2A's only layout resource. Passing R.layout.main to Activity's void setContentView(int layoutResID) method instructs Android to create a user interface screen using the layout information stored in main.xml. Behind the scenes, Android creates the user interface components described in main.xml and positions them on the device screen as specified by main.xml's layout data. The screen is based on views (abstractions of user interface components) and view groups (views that group related user interface components). Views are instances of classes that subclass the android.view.View class and are analogous to AWT/Swing components. View groups are instances of classes that subclass the abstract android.view.ViewGroup class and are analogous to AWT/Swing containers. Android refers to specific views (such as buttons or spinners) as widgets. Continuing, onCreate(Bundle) executes ImageView androidImage = (ImageView) findViewById(R.id.android);. This statement first calls View's View findViewById(int id) method to find the android.widget.ImageView element declared in main.xml and identified as android. It instantiates ImageView and initializes it to the values declared in the main.xml file. The statement then saves this object's reference in local variable androidImage. Next, the androidImage.setBackgroundResource(R.drawable.android_animate); statement invokes ImageView's inherited (from View) void setBackgroundResource(int resID) method, setting the view's background to the resource identified by resID. The R.drawable.android_animate argument identifies an XML file named android_animate.xml (presented later), which stores information on the animation, and which is stored in res's drawable subdirectory. The setBackgroundResource() call links the androidImage view to the sequence of images described by android_animate.xml, which will be drawn on this view. The initial image is drawn as a result of this method call. ImageView lets an app animate a sequence of drawables by calling AnimationDrawable methods. Before the app can do this, it must obtain ImageView's AnimationDrawable. The androidAnimation = (AnimationDrawable) androidImage.getBackground(); assignment statement that follows accomplishes this task by invoking ImageView's inherited (from View) Drawable getBackground() method. This method returns the AnimationDrawable for the given ImageView, which is subsequently assigned to the androidAnimation field. The AnimationDrawable instance is used to start and stop an animation, a process I'll describe shortly. Finally, onCreate(Bundle) creates the Animate button. It invokes findByViewId(int) to obtain the button information from main.xml, then instantiates the android.widget.Button class. It then employs the View class's nested onClickListener interface to create a listener object. This object's void onClick(View v) method is invoked whenever the user clicks the button. The listener is registered with its Button object by calling View's void setOnClickListener(AdapterView.OnClickListener listener) method. To stop, then start the animation, Animate's click listener invokes androidAnimation.stop(); followed by androidAnimation.start();. The stop() method is called before start() to ensure that a subsequent click of the Animate button causes a new animation to begin. Before we continue, replace the skeletal code in your W2A.java tab with the code from Listing 1. Save the contents of this window by pressing Ctrl+S, or select Save All from the File menu. The app's main activity is associated with an XML-based layout, which is stored in file main.xml, and which is presented in Listing 2. After the XML declaration, Listing 2 declares a LinearLayout element that specifies a layout (a view group that arranges contained views on an Android device's screen in some manner) for arranging contained widgets (including nested layouts) either horizontally or vertically across the screen. orientation identifies the linear layout as horizontal or vertical. Contained widgets are laid out horizontally or vertically, and the default orientation is horizontal. "horizontal" and "vertical" are the only legal values that can be assigned to this attribute. layout_height identifies the height of the layout. Legal values include "fill_parent" (to be as tall as the parent) and "wrap_content" (to be tall enough to enclose content). gravity identifies how the layout is positioned relative to the screen. For example, "center" specifies that the layout should be centered horizontally and vertically on the screen. The LinearLayout element encapsulates ImageView and Button elements. Each of these elements specifies an id attribute, which identifies the element so that it can be referenced from code. The resource identifier (special syntax that begins with @) assigned to this attribute begins with the @+id prefix. For example, @+id/android identifies the ImageView element as android; this element is referenced from code by specifying R.id.android. These elements also specify layout_width and layout_height attributes for determining how their content is laid out. Each attribute is assigned wrap_content so that the element will appear at its natural size. ImageView specifies a layout_marginBottom attribute to identify a space separator between itself and the button that follows vertically. The space is specified as 10 dips, or density-independent pixels. These are virtual pixels that apps can use to express layout dimensions/positions in a screen density-independent way. A density-independent pixel (dip) is equivalent to one physical pixel on a 160-dpi screen, the baseline density assumed by Android. At runtime, Android transparently handles any scaling of the required dip units, based on the actual density of the screen in use. Dip units are converted to screen pixels via the equation: pixels = dips * (density / 160). For example, on a 240-dpi screen, 1 dip equals 1.5 physical pixels. Google recommends using dip units to define your app's user interface to ensure proper display of the user interface on different device screens.